I've noticed that I go through definite phases of great enthusiasm for Go, marked by intensive study and lots of play, and then regularly pass into a slump where I have no interest in the game at all. I'm not sure why this is, but I can't be the only one to experience it. Most recently I was hit by a severe flu which made any sustained brain activity impossible for a couple of weeks, and after that I found my enthusiasm was sadly lacking. The slump lasted for a couple of months, and I have only recently started to enjoy playing again and thinking about Go. It makes it hard to set targets for improvement - having reached KGS 15k, I set a new goal of 12k by 1st July, but didn't play a single game! Amusingly, I'm now 10k, but purely due to rank inflation. This presents a problem as any game I play is bound to drag my rank down to a more realistic level - and who wants that? Playing correspondence games on DGS helps, as even in a slump you need to make a move every few days (Fischer time is much more suitable for me as you can gain back time lost during a long slump). I tend to feel a strong resistance to playing, but an even stronger resistance to losing on time usually wins out! The moves I make are poor, not well-thought-out, and I just don't have a good fighting spirit at all. I don't often get a jigo. I was pleased to draw this 4-handicap game on DGS as my opponent (pablopicollo) is a fair bit stronger. However, I missed the winning move. I also thought I had won, but miscounted. Some interesting lessons from this game. I definitely feel that I'm happiest playing opponents 2-3 stones stronger, who can attack well, defend hard, and punish my mistakes. If I win, it's a sweet win, and if I lose then playing over the game can be very instructive. However, I am bad at counting, or just lazy - the one implies the other. I didn't count this at all before passing - I felt pretty confident that I was just ahead, and CGoban's score estimator showed me +1, so I relaxed. Unfortunately, the score is jigo (equal). As if that wasn't bad enough, Pablo pointed out rightly that I had missed the winning move: A6. I need to count more, count better, and count often. Even if I don't count at any other point in the game, I should count carefully just before passing to make sure I know what result I'm accepting! I need to put more effort into the endgame. Because I thought I'd already won, I didn't search very hard for the last 1-point moves. Even if I think I've won, I should still fight for every point. I've been down with the flu for the last week or so and unable to play much, but I have managed to watch and enjoy a few games online at KGS, including a couple relayed by EuroGoTV from the Go To Innovation tournament in Berlin. It is quite fun to watch the game on KGS while having the live video stream on screen as well to see the players' body language, and what soft drinks they have. But while looking around for videos on YouTube from BadukTV and things like that, I discovered a wonderful set of videos from GoCommentary.com. These are teaching videos and analysis of famous games, produced by a strong Chinese amateur player (CountSheep on GoDiscussions). I really enjoyed watching the videos below, about a game played in China in 1680 between Huang Longshi and Jiang Tianyuan (videos and SGF). I mentioned in a previous post that I'd set myself (last October) the goal of reaching 15k on KGS by 1st April. I wanted to make sure it was a stable 15k so I added the secret proviso that I had to keep the rank for 3 successive games. Today was the third game, which I lost, but I didn't drop below 15k - so mission accomplished! An interesting corollary of this was that, having won two very close games, I was sure I was due for a close loss (and indeed so it proved). But I felt a strong reluctance to play, for fear of losing the game and missing my goal. I think this is natural, but something we should try to get over. “When you sit down to play a game is your aim to win the game or to become stronger? You probably think you can do both, but these are quite different projects. The problem with trying to win – besides the fact that it makes it hard to enjoy the game – is that you don’t trust your feelings about where to play. When you look over the board there’ll be a place find you want to play, but if you’re concerned about winning, you’re not going to trust your feeling. You’ll think and analyze and nervously play somewhere else. This is a terrible way to play go. You should look at the board and play wherever you want to. This is the way to get stronger. I say this everywhere I go, around the world, but no one believes me. Nevertheless it’s true." Equally, I think we ought to play without fear of losing, as far as possible. When you win, you win. When you lose, you can learn something and get stronger. Getting too concerned about rank and rating is a sure way to become over-focused on winning games at the expense of developing as a Go player. After all, what's more important: your rating, or your true strength? If you become stronger, your rating will eventually catch up. Having said that, ratings are a helpful indicator that you're making progress. I want to set a new goal now, to achieve KGS 12k by 1st July (3 stones in 3 months). I think that's ambitious, but achievable with some serious study and play, and I shan't worry too much if I don't achieve it. At any rate I will be a better player for trying, and that's what it's all about. I won yesterday's daily KGS game by 3.5 points. Today's was even closer: I squeaked a victory by 2.5 points! I went through the game today and made a few annotations - both Black and White made several mistakes worth more than 2.5 points, so this was probably a classic case of "the winner is the one who makes the next to last blunder". I've been playing Go for a couple of years now and thought it would be fun to write a blog about my experiences playing, studying and teaching.  I normally blog over at Keith Lard's Diary, but Go writing would not be of interest to most of my readers, and conversely Go fans would probably not want to read about all the other stuff in my life which has nothing to do with the game. One of the nice things about Go is that even players of a fairly low level (I'm currently 16k on KGS, 17k on DGS) can teach beginners and weaker players - it's one of the best ways to really reinforce your own knowledge and fill in any gaps. On the other hand, being a good player doesn't automatically make you a good teacher - it's a skill in itself. I have been teaching my mother, who is a remarkably apt student, and is already quite strong enough to beat beginners. But my actual teaching activities have been confined to playing a few small-board games with her on DGS, and occasionally sitting down with her over the board to look at things like ladders and basic fuseki ideas. It can be a frustrating experience teaching, as it is fun seeing people catch on to new ideas, and I always want to go far too fast and jump on to the next thing before the first is fully absorbed. From an interview with Sting: "Yes I've been a teacher for a while, but I've realized that there is no such thing as teaching. There is only learning. The only job a teacher must do is radiate his love for the subject." I found this a very inspiring quotation and it made me resolve not to push my student further or faster than she wants to go, but instead just to let her enjoy herself and to radiate my own love for the game.